Startup Innovation> On what Scale? In contrast, one advantage of virtually bossfree hierarchies is that all employees are involved in the entire value chain from the first idea to delivering a product to the customer to following up with customers on how the product is actually being used. The result is very little institutionalized knowledge, whereby a minority or even just a handful of insiders possess valuable experience and knowledge in a certain area, which they shield from others in order to use it as a bargaining token in fights over resources and budgets. At startup companies, specialists that are difficult to replace are less likely to emerge. Employees acquire a broader skills set and take ownership of the entire development and direction of their company instead of just pursuing their department’s interests versus the interests of other departments. One of the key debates around the innovation and organisations model of startups is therefore scaling. How big can organizations grow until they need hierarchies? The software consultancy firm Pivotal Labs advises its customers that when planning the costs of their development project, teams bigger than five pairs of developer will need an additional person to perform managerial and coordination tasks. The firm also says that in teams consisting of only three pairs of programmers the information overhead turn into costs, making it important to break down projects into segments if more man power than that is needed. Github has structured its process of developing and shipping code around the simple mechanisms of pull requests and constant deployment so that teams of 15 to 20 developers can work on the same projects, according to Scott Chacon, one of its employees. At what point do daily discussions about new ideas and small sections of code need to be complimented by a global direction the company should take, developed by its members but with progress and direction ensured and measured by a manager? One safe way to scale is to involve customers. Large communities of software developers have proven to be surprisingly effective in stemming even complex tasks such as developing entire operating systems. Linux is the best-known example for this. 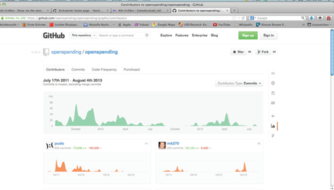 From this perspective, Github is more than a software startup. It is an online platform that hosts code for entire communities of software developers. This ranges from small groups of tech freaks working on open software projects to big corporations that use Github for privately developing software. In 2011, only three years after its start, Github was considered to be the most popular open source code repository site. The company said in September 2012 that it had more than 2.1 million users hosting over 3.7 million repositories of code. The online platform makes it easy to jointly work on developing code, no matter where on the globe the contributors are based. The code is placed in so called repositories, to which everybody has access. Developers can propose changes to the master developer/ owner of a repository through the site. But Github is more than just a site that hosts code, it is also social media. It has built in many features known from social media sites such as Facebook or Twitter. Its users have their own profiles showing what they are working on, they can follow other users. A network graph can display how different developers work on different version of repositories. Just like on Facebook or Twitter, the community status of a developer can be derived from the number of followers that he has. There are coding rockstars who are closely watched for what they are watching. The quality of a project can be judged from the number of people working on it. This social media kind of interaction significantly accelerates the speed with which a community can identify and jump on new, promising projects. The constant watching of each other and the interaction around pull requests establishes and implements community values. It forces developers to ensure that their code works and does not break what so many others are working on. It establishes and implements an unwritten code of behavior that has emerged on its own in many social media applications. This code values a culture of gifts, a spirit of give and take which sharply contrasts with the culture of insider knowledge and internal power struggles that are widespread at most bigger corporations.